“It’s she-wolf,” my driver said, referring to the fur collar on his caped Inverness-style overcoat. “I don’t follow international fashions.” He has that in common with Portuguese wine, which, to a large extent, is still made with the country’s wonderful array of indigenous grape varieties, many of which are grown nowhere else. 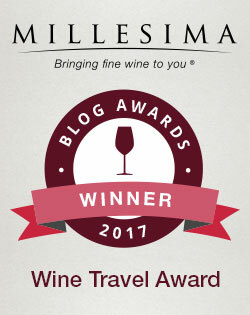 That’s not to say, however, that Portugal’s wines aren’t of international caliber. In fact, they offer some of the best quality-to-price ratios in the world. We drove down an allée leading to a winery, with vineyards on one side and a crumbling stone wall on the other. “I can’t believe it. I’ve never been here,” he exclaimed. “How an American discovered this place, I don’t know.” The wonderful thing about traveling as an American in Europe is that it’s incredibly easy to impress the locals, many of whom expect people from the U.S. to be ignorant, monolingual barbarians. But discovering this winery, Villa Oeiras, was not so easy. My journey there started with a rather distressing entry in The Oxford Companion to Wine about Carcavelos, a “tiny [DOC], renowned in its heyday for fortified wines. 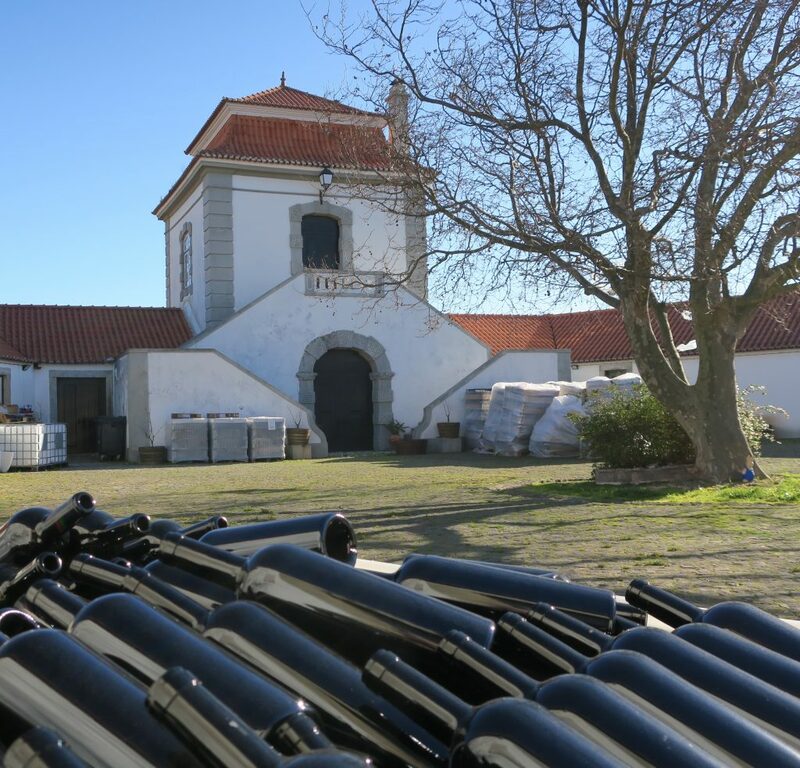 However, its vineyards have almost been obliterated by the westward expansion of the capital city Lisbon along the Tagus Estuary.” The entry went on to mention a winery, Conde de Oeiras (the former name of Villa Oeiras), which was still making Carcavelos. I knew I had to find it, this, the very last winery in a DOC which is dangerously close to disappearing entirely, forever. I found myself in Lisbon in January, and I was determined to do whatever it took to visit Villa Oeiras. Finally, the day before my last chance to visit, my hotel concierge was able to confirm an appointment. The winery’s vivacious guide, Sara, met me in the courtyard of the pentagonal Casal da Manteiga, a building which once served as a dairy (now it houses fermentation tanks and an aging room). We walked into the vineyards just outside, growing on an ideal south-facing hillside sloping gently down towards the estuary. Blocky apartment buildings loomed not far from where we stood, built, no doubt, on what had also been vineyards at one point. Only about 31 acres of vineyards are now devoted to producing proper Carcavelos. 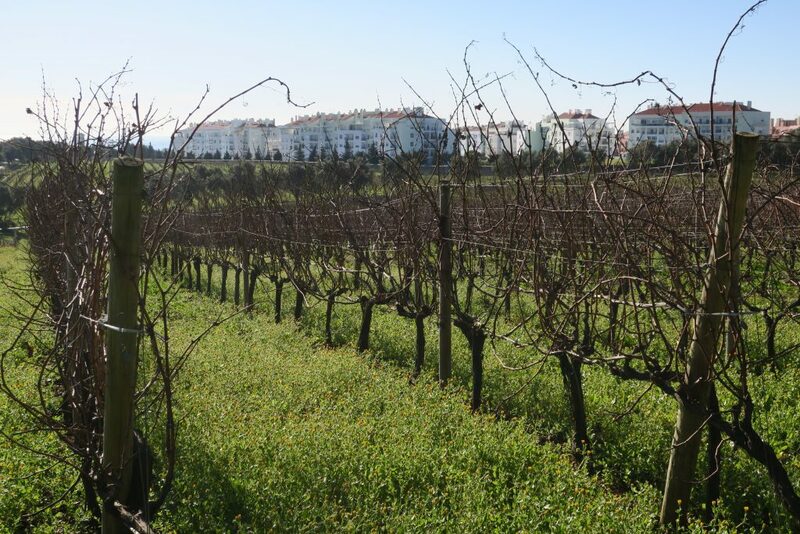 These vineyards were preserved from development only through an unusual partnership between the municipality of Oeiras and Portugal’s Ministry of Agriculture, and Villa Oeiras is the only publicly owned winery in Portugal. It encompasses part of the original 615-acre estate of the Marques de Pombal, the prime minister responsible for reconstructing Lisbon after the devastating 1755 earthquake, and for creating Carcavelos (“…he had to do something with the grapes from his country residence at nearby Oeiras,” according to the Oxford Companion). 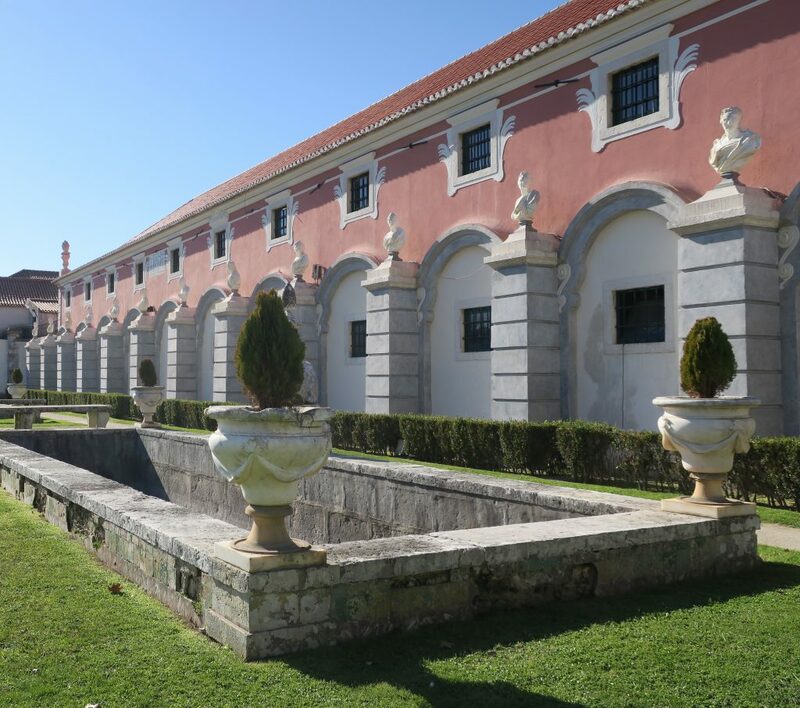 In addition to preserving these Carcavelos vineyards, the partnership restored the 18th-century aging facility in the Marques de Pombal’s palace, which had been converted into offices. The original architect cleverly built the barrel room atop a natural spring, ensuring that humidity constantly suffuses the space, and its design also fosters natural air circulation. The austere, vaulted room is beautiful, too, and I only wish I had been able to help tear out the cubicles which once cluttered it. But what is Carcavelos? The Villa Oeiras estate produces several bottlings, in fact, including table wines. But traditional Carcavelos, like Port, is fortified. The winemaker allows fermentation to go only so far before killing the yeast with the addition of strong brandy. The wine retains its sweetness, because the yeast didn’t have the chance to consume too much sugar, and it has plenty of power because of the higher alcoholic content. Barrel-aging provides additional complexity. 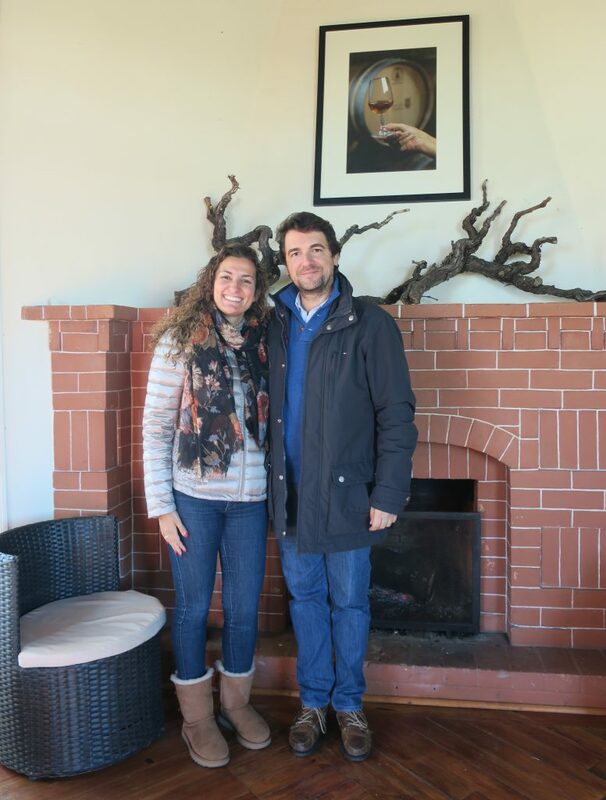 The dashing winemaker, Tiago Correia (to whom Sara recently became engaged), met us in the vineyards and escorted us into the fermentation room. There we tried tank samples of the three component parts of white Carcavelos: Galego Dourado and Ratinho, grown almost exclusively in Carcavelos, and Arinto, which is also found just to the north in Bucelas. Each grape offered something exciting and different. The Arinto had pleasing honeysuckle notes, a pop of spice and an “elegance of acidity,” as Correia put it. The more mellow Galego Dourao tasted sweet and orangey. “Galego is nothing in the beginning,” Correia explained, “but with aging, it is the glue that holds the wine together.” And I won’t soon forget the amazingly bright and zesty Ratinho, full of lemon oil and white flowers. Correia also gave me samples of young Carcavelos straight from the tank. The 2016 already felt balanced, with plenty of fruit and acidity along with some smoothing salinity, and the previous vintage had started to develop some richness. The 2014, though still quite young, felt more mature, with weight and calm leavening the spiciness. The Carcavelos then ages in oak barrels for several years. Correia continues to experiment with different kinds of oak (French, Portuguese) as well as different “toasts,” meaning how much the interior of a barrel is charred. 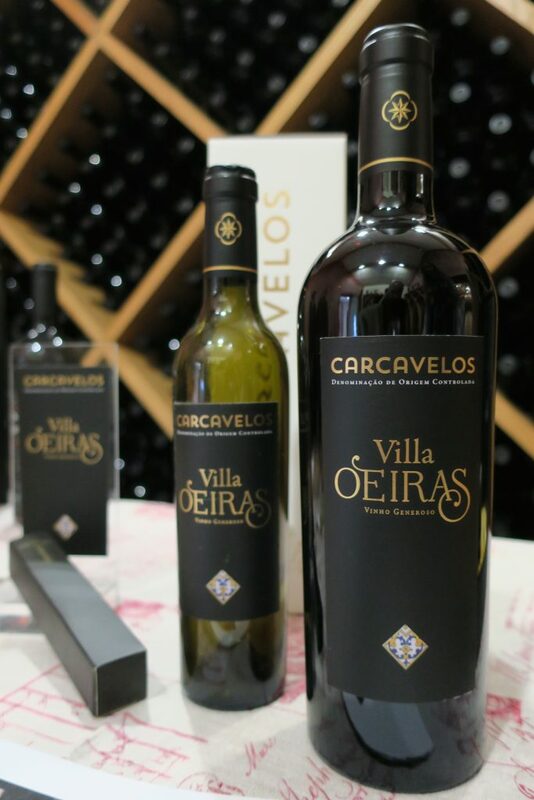 Villa Oeiras’s flagship Carcavelos sees 10 years in oak and a year in the bottle before its release. I also tried the red Carcavelos, aged eight years in oak (so far) and not yet bottled. This wine, made from Castelão, Trincadeira and Amostrinha, was nothing short of extraordinary. Big and zesty, it tasted of deep, sweet berries buried in nuts. It was powerful, but it moved with such grace, and the finish rang with salinity and eucalyptus freshness. Then there was the 2004 white Carcavelos (the flagship white is non-vintage), with its shockingly fresh spice, bright wood and seemingly endless finish, and the 1997, to be released in 2017 as a 20-year Carcavelos. (1997 is the year when the municipality of Oeiras and the Ministry of Agriculture first created the Carcavelos partnership.) It had similar power and richness as its younger siblings, but the ’97 displayed an elegance worthy of Grace Kelly and Fred Astaire. Sublime. The story of Carcavelos, the wine that almost went extinct, is a wonderfully romantic one. But even if I had known nothing of the wine’s historic pedigree and near demise, its richness, complexity and power would have deeply impressed me. This wine is a cultural treasure. If you plan on visiting Lisbon, seek it out (it’s pronounced “Vee-la oh-I-rahsh car-ca-VEL-ohsh”). The excellent Garrafeira Nacional wine shop in the Baxia carries it, and some restaurants (Alma, for example) have it on their wine lists. Bring home some beautiful Port and Madeira, by all means, but leave some room in your luggage for a bottle of Villa Oeiras Carcavelos, a sumptuous and elegant wine barely rescued from oblivion. Ordinarily I might agree, but Villa Oeiras is something very good indeed. I tasted this in Lisbon recently and it is divine! I brought a bottle home and plan to pick up another (and now try to visit the vineyard!) when I return later this year. The person who introduced this to us said it was a special wine for special occasions and told us the story. Great post! Thanks for sharing! Hi Rebecca — Thank you for your kind words, and I’m so glad you enjoyed the Carcavelos as much as I did! Have a wonderful time when you return to Lisbon. I must admit I’m quite envious; it’s such a delightful city. 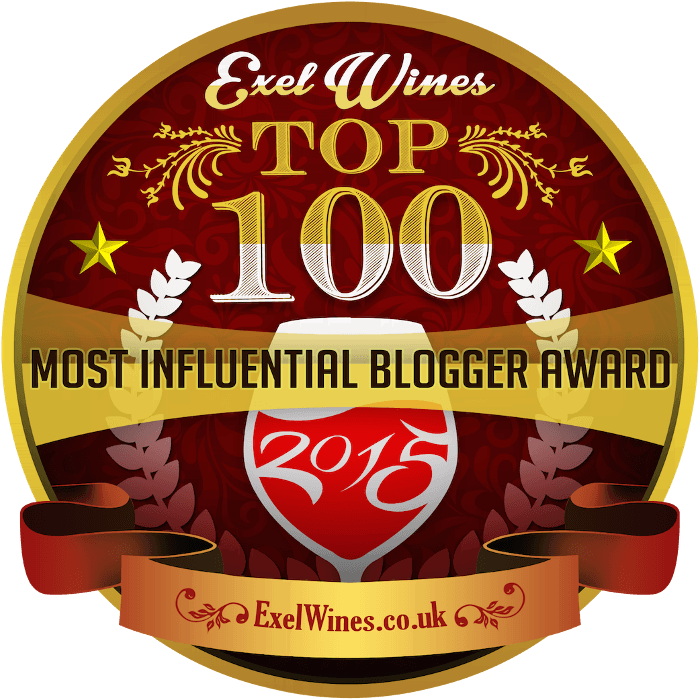 If you make any other good wine discoveries, I would love to hear about them!